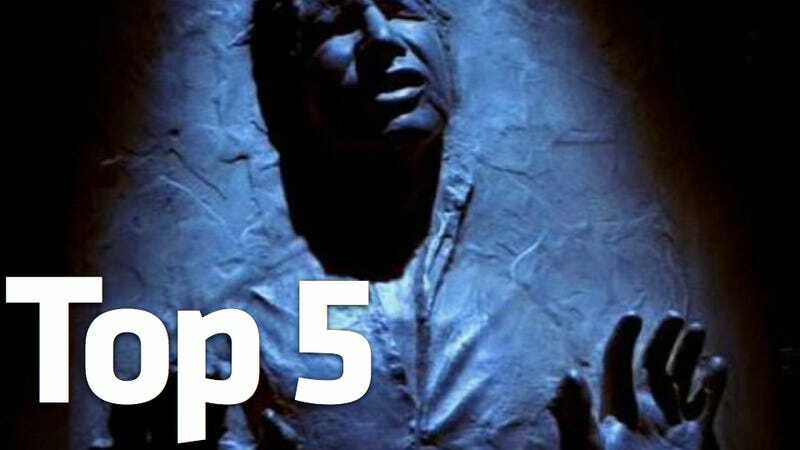 • 12 Awesome Han Solo Frozen in Carbonite Tributes [oddee] From ice cube makers to cell phone cases to that badass executive desk, I can't argue with the awesomeness of any of these. • Top 5 Call of Duty Campaigns [Gaming Bolt] This may sound like "Top 5 sprigs of parsley served by Outback Steakhouse," but, once upon of time, this game was actually served by decent singleplayer gaming. Of course, while Call of Duty 2 is here (at No. 2), so is every Modern Warfare—and Black Ops, which was a spoon-feeding occasionally broken up by set pieces and Quicktime events. • The 15 Best Shooter Games [GamePro] Surprise, no Call of Duty in the Top 10 (Battlefield 3 is, though). And a Wii game is No. 4. Don't worry, it's not Conduit 2. Not sure I'd call No. 5 or No. 6 "shooters," however. • Ten Unforgettable Skyrim Characters [IGN] Bigtime spoiler alerts here, so I won't provide any hints on who does or doesn't make the list, but if you're willing to read what lies ahead, this list contains a few tips and hints, too. • Ten Games You Don't Want to Get for Christmas [Gamer Fit Nation] Here are ten games some guy doesn't want, written like it's an email. He doesn't like Brink.